“To most geologists, geologic maps are the single most useful type of information for understanding the geology of the land surface. 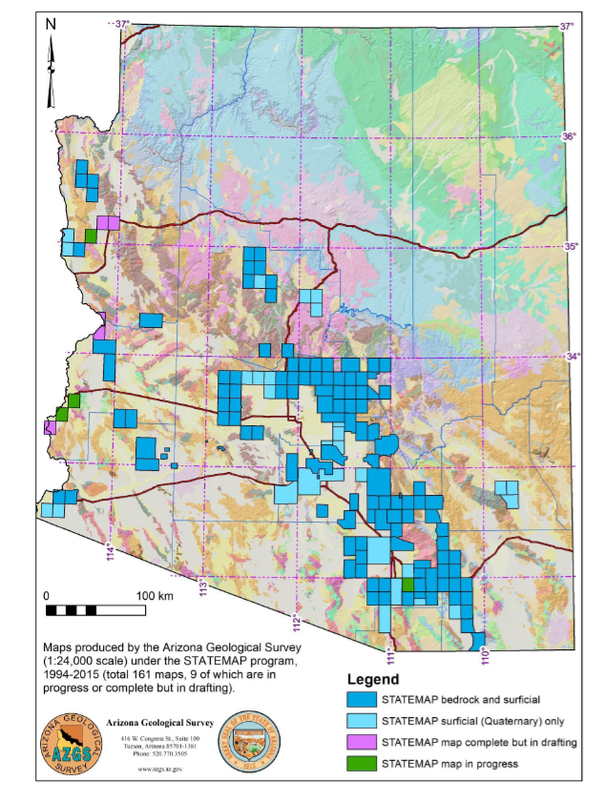 As a result, geologic mapping in Arizona has a long history, with over two thousand geologic maps produced in Arizona since about 1900.” Arizona Geological Survey Senior Geologist Jon Spencer. The Arizona Geological Survey (AZGS) just released a geologic map index by Jon Spencer and Steve Richard comprising maps that are available from the AZGS’ online Document Repository. The index includes the citation, location and map scale data for approximately 720 maps of areas within Arizona derived from approximately 500 publications. 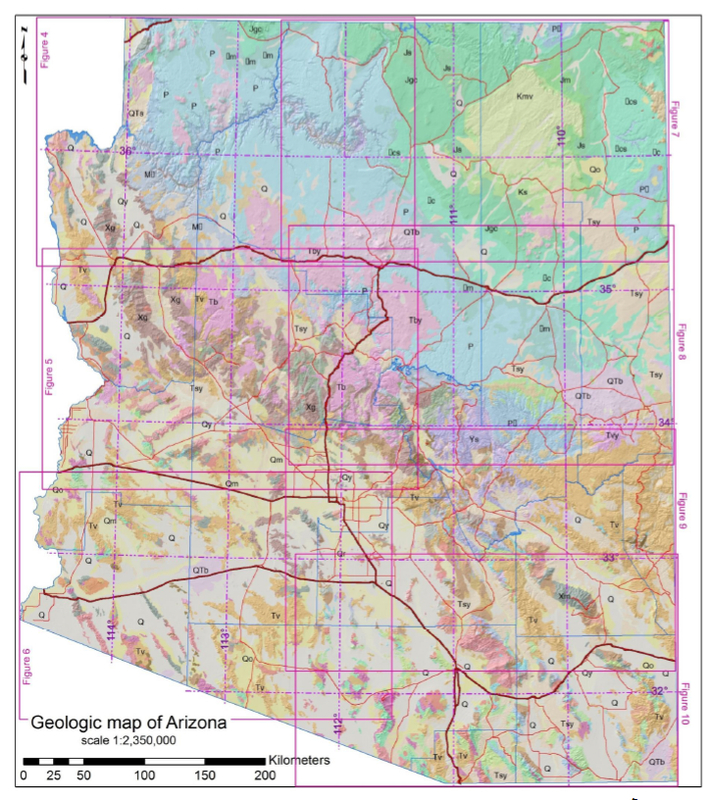 The Geologic Map of Arizona (2000) (Figure 1) is used as background to the map indexes. Figures 2 and 3 identify regional maps with scale ranging from 1:100,000 to 1:1,000,000. Additional figures identify detailed geologic maps with scale ranging from 1:200 to 1:99,000. Each map is labeled with a publication serial number, for example “OFR 95-1” or DGM-76. The map indexes are followed by a list of map citations organized alphabetically by publication serial number (pubNum). Generally, a user of this index would locate an area of interest on a map index, identify the publication numbers for maps in the area of interest, and then find the relevant citation or citations. With the citations one can then retrieve the desired maps from the document repository at the Arizona Geological Survey web site. Following the list of citations are several maps that show the locations of geologic map areas with the map areas colored according to the program that at least partially funded the mapping. The most important of these funding programs has been STATEMAP (1993- present) (e.g., Figure 4) and its predecessor COGEOMAP (1984-1993). STATEMAP was established by the National Geologic Mapping Act of 1992 in order to promote production of new geologic maps, and is directed specifically at State geological surveys. States participating in this program are required to provide matching State funds at least equal to the requested or granted Federal funds. Map areas are determined following annual recommendations from the Geologic Mapping Advisory Committee, which is composed of about a dozen individuals from government, industry, and academia. This program has brought over $3.7 million in Federal funding to the AZGS for new geologic mapping. The AZGS was preceded by the Arizona Bureau of Geology and Mineral Technology (AZBGMT) at the University of Arizona during 1977-1988 (before that it was the Arizona Bureau of Mines). Western Arizona maps released during 1980-1994 and not funded by COGEOMAP reflect scientific interest in this part of Arizona because of the extreme Cenozoic crustal extension that had affected the area and because a newly recognized class of mineral deposits is associated with the tectonic extension. Mapping was supported by the AZBGMT and the AZGS and this support was used to match requested COGEOMAP funds. Last, the report shows areas of geologic mapping by authorship, with 17 authors having done most of the STATEMAP and much of the COGEOMAP mapping in Arizona, as well as other mapping with different funding sources. AZGS has had a strong geologic mapping program since about 1980, and continues to both produce new maps and solicit contributions of geologic maps to the AZGS Contributed Map Series. The latter reflect the work of non-AZGS employees, commonly for thesis or dissertation projects, and are considered of sufficient quality to warrant release through the AZGS map repository. Editor’s note: The text for this article was largely drawn from Spencer and Richard (2015). Citation: Spencer, J.E. and Richard, S.M., 2015, Map index for geologic maps available from the Arizona Geological Survey. Arizona Geological Survey Open File Report, OFR-15-01, 32 p.